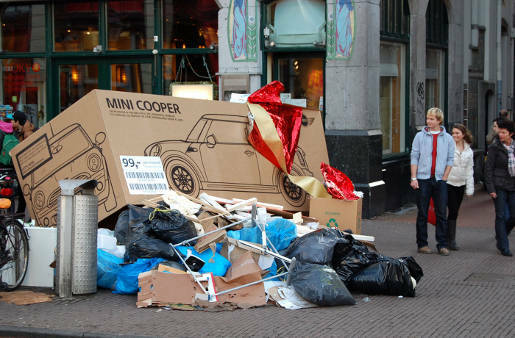 Mini Cooper Boxes in Amsterdam. 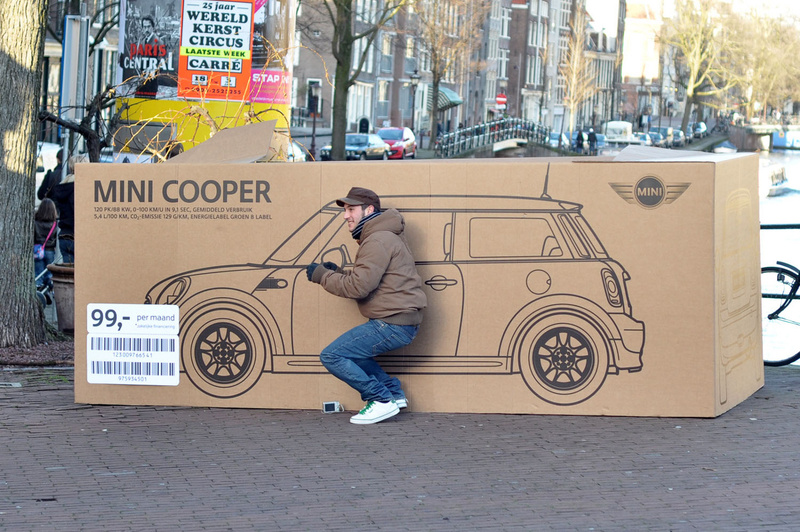 A rather wonderfully executed guerilla campaign by Mini Amsterdam featuring packing boxes in prominent locations around Amsterdam. 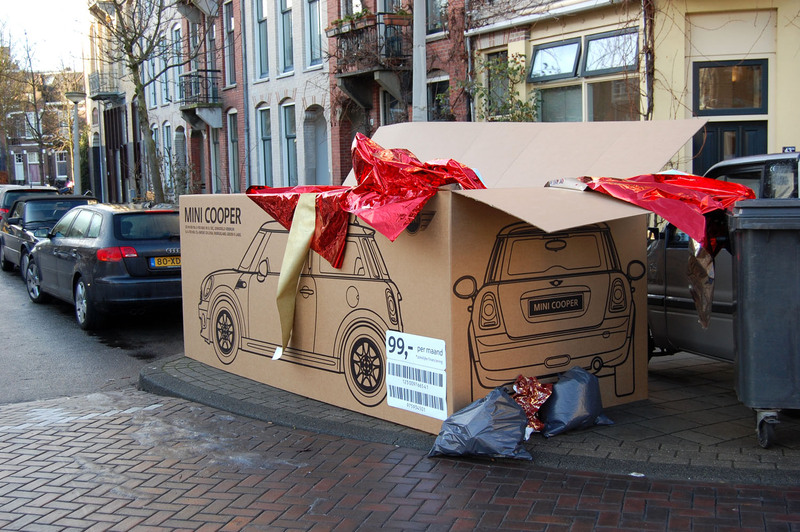 They are promoting something that you probably wouldn’t know about or be interested in but this brings in to the forefront, a 99€ a month finance deal which is available on the Mini Cooper. Taking a fairly run of the mill offer, like a finance plan and making it part of something compelling. Lovely. Here’s a few images and videos to illustrate. Now perhaps somewhat of a TED classic, this is definitely worthy of your time, the video that is. Rory is not only someone with a deeply ingrained wealth of knowledge and experience, but I think he’s truly emblematic of our time. Why? Well, along with all that, it would seem he maintains a curiosity for this new world we live in and an enthusiasm to try out all the new tools that have sprung up and become part of every day life. In this TED talk he mentions amongst other things, the skills and creativity involved in creating intangible value, and that’s an important one, especially with social media, creating value that you can’t touch. I like the musings that advertising isn’t getting people to buy stuff that they do not need as much as it is getting people to value what they already own. Fascinating stuff. A point is also made that many of life’s problems could be solved by “tinkering with perception”. Isn’t that what we’re all trying to do with all these creative, groundbreaking projects on behalf of bold / brave clients? Challenge perceptions, push the boundaries, reach new heights? The Diamond Shreddies are a perfect case study, where something so simple to everyone (in hindsight) as flipping shreddies on it’s side resulted in raising sales by 18%. Truly remarkable. We’re told that the traditional shreddies is old and boring (below) whilst being shaped as a diamond instantly makes them ‘better’, ‘more flavourful’ and ‘crunchier’. Astounding. It’s the same shreddies but the perception we are being sold is of these new experiences to be had with the Diamond Shreddies. And we believe them. Hence why sales rose. Of course, I digress. There was some criticism of the points Rory made here and then furthermore in the comments.. but I got bored of the arguing and going round in circles in the comments but hey, it’s encouraging some debate and thought around the subject isn’t it. Close to 100 comments here also, on TED, mostly wildly cynical and dismissive but isn’t it great when Rory himself pops in, says hello and silences a few critics. Truly brilliant. After all that waffle, here it is.. Enjoy. Another one of those social media ROI videos..
Feast your eyes. At least this one doesn’t have that Fatboy Slim backing track. 1. Over 300,000 businesses have a presence on Facebook and roughly a 1/3 of these are small businesses. 2. Gary Vaynerchuk grew his family business from $4 million to $50 million using social media. 3. Lenovo was able to achieve cost savings by a 20% reduction in call center activity as customers go to community website for answers. 4. BlendTec increased its sales 5x by running the often humorous “Will it Blend” Videos on YouTube. 6. Obama Social Media Marketing resulted in three million online donors contributing $500 million in fundraising. View more documents from Mike Arauz. Interesting stuff. Mainly US brand pages, to be expected. View more documents from Willis Wee.